What happens to wood waste after a hurricane? On a cold, clear December day, two bulldozers were moving mountains of woody debris around Floyd Bennett Field, an abandoned airport-turned-park in Brooklyn. Nearly six weeks after Hurricane Sandy struck New York City, a titanic mass of tree trunks, branches and wood chips—enough to fill about 80 Olympic-sized swimming pools—lay in the field’s parking lot, ready to be moved as the storm clean up continues. The question now is how to get rid of it all? Taking the reins from the city, the U. S. Army Corps of Engineers is looking for ways the wood waste can be reused as garden mulch, landfill cover or fuel for biomass power plants. But high transportation costs and contamination by the Asian longhorned beetle make this recycling difficult. The mountains of wood waste in Brooklyn are the result of weeks of frenzied clean-up activity by contractors and public agencies all over the region. “You got to move. You don’t want a lot of mixed materials sitting in the street because it can cause health and safety concerns,” said Al Boice, a construction services manager at Waste Management. Boice’s company, which disposes, recycles and burns waste for electricity production is helping to clear storm debris from the Bronx and Westchester counties. Floyd Bennett Field is one of the largest of the temporary storage sites that were set up across the region to collect and manage the wood cleared from the streets. It was initially set up by the city’s sanitation department, with contributions from the parks department. It handles all of the fallen trees and branches that have been picked up on the curb throughout the city since the storm. The site is now managed by the Army Corps using $95 million from the Federal Emergency Management Agency (FEMA). Before it can be reused, the wood needs to be processed into smaller pieces. Chippers and grinders that can handle a “titanic pile of brush” take on this task, said Jonathan Parrot, a project manager at Northern Tree Service, a tree care company based in Palmer, Mass., that is assisting with cleanup in the Bronx, Queens and New Jersey. In 2011, the company processed half a million cubic yards of wood following an October snowstorm in Springfield, Mass., as part of a $33 million cleanup effort in that city. 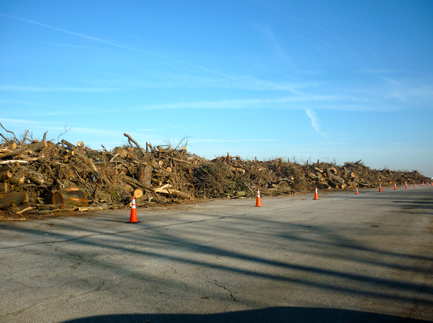 Caption: Around 208,000 cubic yards of woody tree debris are piled up at Floyd Bennett Field. But in New York, there’s a complication: because so many local trees have been infested by Asian longhorned beetles, the wood waste has to be chipped into tiny pieces to prevent the insect from reproducing. Chipped fallen trees from Prospect Park, for example, are being reused as mulch only in parks around Brooklyn to avoid infesting other areas with the tree-killing pest, according to Paul Nelson, a spokesperson for of the Prospect Park Alliance, a nonprofit group that works with the city to manage the park. Even if the beetle wasn’t a problem, the more than 208,000 cubic yards of material already at Floyd Bennett Field – with more coming every day – is too much for all of the city’s parks to receive as mulch. “We would prefer to give all of the mulch away to people who want to use it for biomass fuel, landscaping mulch and landfill cover,” said Jeff Hawk, a spokesperson for the Army Corps who was working at the recovery field office in New York in December. “But there is a lot of material out there and it does present a safety hazard,” as the woodpiles could catch on fire. Working mostly with local subcontractors, the Army Corps has been doing whatever it can to get rid of the wood. Not everyone has been satisfied with the chips they have received. The Burlington County Resource Recovery Complex, a waste management facility in southern New Jersey, stopped accepting the wood chips after initially agreeing to take them for landfill cover. “It did not appear to us that it was reduced in size enough to meet the requirements,” said Bob Simkins, solid waste coordinator at the site. Simpkins is worried about beetle infestation. New Jersey has spent the last 12 years trying to eradicate the beetle from the state, and their efforts are nearly complete. “You certainly don’t want to make a mistake,” he said. Another option is to burn the chips in biomass power plants. “We currently have a bid in to accept storm wood from Sandy,” said Dave Clare, who purchases fuel for Niagara Generation LLC, a wood-burning power plant in Niagara Falls, New York. The company provides electricity to about 40,000 homes in the area. Back in 2008 and 2009, up to fifty percent of the wood they burned came from fallen trees following an October snowstorm in Western New York. But getting clean wood to a biomass power plants can be difficult amidst the frenzy of the post-Sandy clean up, where many different kinds of wastes tend to intermingle. “Everything is just mixed together,” said Bob Phaneuf, an emergency response coordinator at New York’s Department of Environmental Conservation. Despite the hurdles, the Army Corps continues to look for ways to dispose of the wood as quickly as possible. In late November, some wood was burned using an incinerator trucked up from Virginia. Environmental agencies monitored the air emissions, and decided that the incinerator could serve as a possible option for disposing of stumps and other unchipped wood. A final report on the testing is currently in the works. Burning additional wood, however, would require temporary permission and monitoring from city, since open burning is illegal in the five boroughs. Very well written article. I wish I could read more of the author’s work. Great descriptions and in-depth knowledge on tree processing! Thanks for the great post, it’s great to be educated. Keep it up. Interesting article! It is great to know that we are actively looking into ways to repurpose wood even if damaged by insects and find clean, reusable solutions to fallen trees after storms.